Canada’s darling Ingrid Veninger has always been a director of films with strong female content. Who then best to write and direct PORCUPINE LAKE, a story of bravery and the secret life of girls set in Georgian Bay, Northern Ontario during a hot and hazy summertime when adulthood has not yet arrived, but childhood is quickly vanishing? Verninger has made low budget Canadian films that have gone on to win many awards. ONLY, MODRA, i am a good person/i am a bad person are her most popular ones. They all reflect the ease of Veninger’s craft and are personal yet entertaining features. Port Severn is displayed proudly on a sign in one of the film’s scenes. This is a beautiful yet quiet region that a few tourists venture to, for good old Canadian nature. Veninger has chosen an appropriate and pretty place for her film’s setting, that few films have. Another scene has a Canadian flag on a pole. Ally (Delphine Roussel) arrives with 13-year old daughter, Bea (Charlotte Salisbury) in tow from Toronto to meet up with her husband, Scotty (Christopher Bolton). Bea learns through a local, Kate (Australian Lucinda Armstrong Hall) independence, as well as the facts of life about boys and growing up. All Be a wants is a friend she can hang around with. As they say, be careful what you wish for. Kate is the companionship Bea’s mother is unable to offer, and the two bond a strong friendship. But Kate is sometimes a friend from hell. Kate teaches Be a nasty things, like practical French kissing and some facts of life. Verninger is quick to insert conflict into her characters. In one scene she has Scotty talking about keeping his store (place) within his family and another next scene with Ally telling another person about selling the place. Another has Bea keen to sleep over at her friend’s with Scotty asking Ally to let her. “Please don’t,’ says Ally to Scott right after. Most of the conflict occurs between couples, as can be seen in other instances in this film and in her others, perhaps reflecting director Veninger’s personal experiences (not a bad thing) with conflict with her relationships. 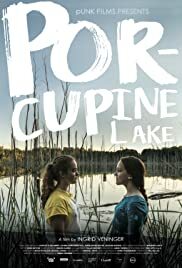 The climx of PORCUPINE LAKE is whether Kate will end up going to Toronto with Bea. Kate wants to go and Bea loves for her to come along. The mothers object for obvious reasons. PORCUPINE LAKE is the most ambitious and strongest of Veninger’s films (also beautifully shot by Benjamin Lichty), her popular film ONLY being screened at a local cinema that Bea and Kate attend at one point in the film. Veninger proves once again, she is always in control of her material and meticulously drives her film to its emotional climax and coming-of-age message. The film works because Verninger shows she understands her characters, all of whom undergo development for the better.